Advanced TV presents new opportunities to streamline and enhance multiple areas of a broadcaster’s business, across content development, distribution, monetization, and more. Whether it’s the ability to reach viewers across screens with new direct-to-consumer apps or engage viewers with more personalized content and ads, the opportunities are endless. 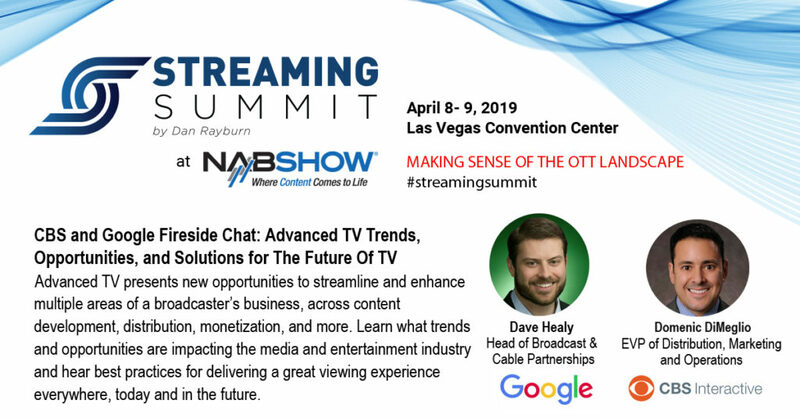 At the Streaming Summit, taking place April 8-9, at the NAB Show, Dave Healy, Head of Broadcast & Cable Partnerships at Google and Domenic DiMeglio, EVP of Distribution, Marketing, and Operations at CBS, will discuss the trends and opportunities that are impacting the media and entertainment industry and talk about best practices for delivering a great viewing experience everywhere, today and in the future.